Kahati Ayodhyadas tum, deu abhaya vardan. Hail Lord Ganesh, son of Girija, who is supremely wise and the start of all auspicious events. Ayodhyadas asks you, to grant him the boon of safety and security. Who always looks after and protects his devotees. and in his ears, instead of rings, he has the serpents coiling around. Around his neck, he has a necklace of severed heads and his body is smeared with ash. Looking at his charming view, the serpents and high sages get enchanted. Bam ang rajat Shiv pyari. She is supremely dear to Lord Shiv. with which he slays the enemies forever. Manas madhya kamal hon jaise. Looking as beautiful as lotus flowers blooming in Mansarovar lake. Ya chhavi barnat bane na kauo. No one is capable to describe the full spectacle. You always solved the problems and provided succour to them. devan sab mili tumhari pukari. The celestials all called to you help. Luv nimesh mahi mar girayo. Who, within no time at all, destroyed the demon. Your glory is well known to the world. sabahin kripa kari leen bachayi. You forgave everybody and saved the Gods. And by you grace, you fulfilled his wishes. That is why your devotees always sing your praise. akath anadi bhed nahin payee. It is impossible to fathom your full glory. Which scared both the Gods and demons. You gave him victory over Lanka and made Vibhishan it's king. Then to assess his firmness of faith, you decided to test him. Kamal nayan poojan chahin soyee. Not finding it, Lord Ram substituted his lotus like eye for it. Bhaye prasanna deya icchhit var. You granted him the desired boon. Karat kripa sab ke ghatvasi. Shower your grace on everybody, O Omniscient one. Bharmita rahe man chain na aven. This makes me distressed with no peace of mind. Yeh avasar mohi, ani ubaro. O Lord, help me in these troubled times. Sankat se mohi ani unarau. And free me from my problems. Sankat mein poonchat nahi koi. Yet in times of trouble, nobody offers me help. Ai harahu sab sankat bhari. O Master, please come and take away this heavy burden (problems). Arat jan ki peer mitaee. And you wipe away their difficulties. Hey, Shambunath, listen to my prayer now. Saraswati, Narad and the seers bow in reverence to you. Neither Brahma not the Gods could fathom your entire glory. To kon hot hain shamboo sahayee. Shall definitely be helped by Lord Shamboo, without any doubt. Nishchaya Shiv prasad se hoi. 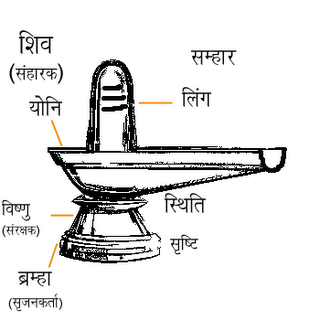 Will definitely be blessed with one by Lord Shiv. And with full attention and devotion, one must pray to Lord Shiv to get their wishes fulfilled. Tan nahi take rahe kalesha. Gets peace of mind and a healthy body. One should worship before an idol of Lord Shiva with full devotion. And in the end, he will live happily in the kingdom of Lord Shiva. Dukh peera ab harahu hamari. Now please end all my pains and worries.